“Nung hindi pa kami kabilang sa Pantawid, d’un kasi pumapasok ang pagkamakasarili; yung ideya ko, ideya ko lang. Pero nung magkaroon na po ng Pantawid, nando’n na po yung FDS (Family Development Session)kung saan namin natutunan ang socialization – kung pa’no makisalamuha, kung pa’no tumulong, at kung pa’no ibahagi yung mga ideya na natutunan mo sa iba.” – Liliosa Bulso of Bulso family, 2016 Regional Winner, Huwarang Pantawid Pamilya. Jomer Elamparo, former RRCY resident shares how life at the center has transformed him. He is now a graduate of Hotel and Restaurant Management and does a part-time job in one of the restaurants in Magalang, Pampanga. 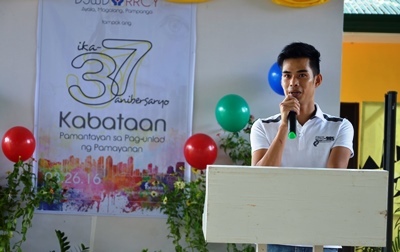 “Everybody deserves a second chance,” Director Gemma B. Gabuya of the Department of Social Welfare and Development Field Office III stressed in today’s celebration of the 37th anniversary of the Regional Rehabilitation Center for Youth (RRCY) in Magalang, Pampanga. Our government has the accountability to ensure that all children enjoy their rights. As residents, you have the second chance to fulfill your dreams, to become good parents and future leaders of our country, Gabuya stressed. She also urged the residents to continue their involvement in the regular activities within the center to be more productive and progressive individuals as soon as they are discharged and reintegrated to their respective families and communities. She stressed that they should learn the essence of imbibing positive values to become better citizens. Gabuya added that the DSWD and the local social welfare and development offices (LSWDOs) will continue to advocate for the rights of children. She also lauded the RRCY staff for their contribution in the development and transformation of the residents under their care. “I support your advocacy of fulfilling your mandate of providing social protection for the children in conflict with the law (CICL),” she said. In addressing the community, she said, “Nasa kamay ninyo ang pag-ahon ng mga batang nakalabag sa batas”. Meanwhile, Jomer Elamparo, former RRCY resident who stayed at the center for more than four years, shared how life at the center has transformed him. He is now a graduate of Hotel and Restaurant Management and does a part-time job in one of the restaurants in Magalang, Pampanga. Jomer recalled that he was only a second year high school student when he came to RRCY. He enrolled in Alternative Learning of the Department of Education (DepED) and accelerated to college. “Ang mga pagsubok di naging hadlang sa pag-abot ko ng aking pangarap. Proud ako na sabihing galing ako sa RRCY dahil dito ako nahubog. Di lahat ng may kaso ay masama,” Jomer said. We are the author of our fate, he added. Ginagabayan tayo ng Dios sa pamamagitan ng mga staff sa landas ng pagbabago ngunit ang pagbabago ay dapat magsimula sa atin. He also encouraged the RRCY residents to forget the past and live for today. “tulad ko, may pagkakataon pa kayong ituwid ang mga nagawa ninyo at sakaling paglabas ninyo ay maaari kayong maging modelo ng ibang kabataan,” he said. Consists of suppliers and service providers, Team Liberica Cofea huddles and discusses procurement matters with the facilitation of Bids and Awards Committee (BAC) secretariat during the Kapihan with the suppliers and service providers. With the aim to reduce the level of corruption vulnerabilities in bidding and procurement matters, the Department of Social Welfare and Development (DSWD) Field Office III conducted its first Kapihan with 28 suppliers and service providers. 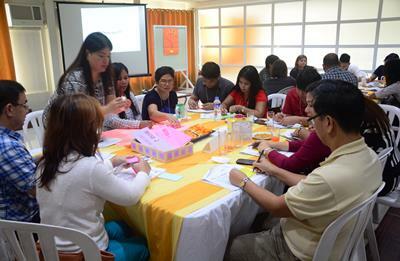 The workshop was held at Orotel, City of San Fernando, Pampanga, August 25. Despite the technicalities of the matters discussed in the workshop, it was filled with light, chatty vibe, as if the participants and facilitators were just having a extended coffee break, remaining true to the term Kapihan. In the Kapihan proper, participants wrote their comments and suggestions on their transactions with the DSWD. A participant wrote, “Walang corrupt sa DSWD. 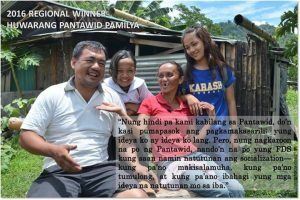 (There’s no corruption in the DSWD)” Another wrote, “Isa sa tatlong ahensiyang pinagkakatiwalaan kong katransaksyon. (One of the three government agencies I trust during transactions. )” Meanwhile, some offered their suggestion to fast-track the transaction process with the DSWD. Another participant raised his issue on delayed payment. The workshop was patterned after world café, a participative and inclusive type of workshop set-up. Here, all participants were grouped according to the type of merchandise and service they provide. During the breakout session, participants discussed technical matters related to procurement. 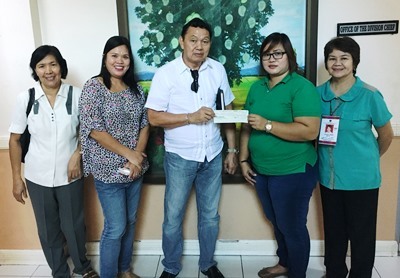 DSWD Field Office III Assistant Regional Director for Operations Venus F. Rebuldela (2nd from right) awards the check worth P2,936,128.00 for the Supplementary Feeding Program (SFP) to Mayor Celestino Marquez (center) of Pandi, Bulacan. Witnessing the event are (from left to right) Pandi Municipal Treasurer Priscilla de Jesus and MSWDO Teresita Gabriel, and Ms. M. Elena Carreon, SFP focal person. Some 175,705 day care children in Central Luzon has started to benefit from the Supplementary Feeding Program (SFP) of the government. Ma. Elena Carreon, Senior Dietary Nutritionist and SFP focal person of the Department of Social Welfare and Development Field Office III (DSWD FO III) said that the government has allotted P319,255,985.00 for the program implementation in 3,849 day care centers in 116 municipalities and 14 cities of Central Luzon. To date, DSWD FO III has already transferred the amount of P50,627,614.00 to 24 municipalities of Region 3. Just recently, the Field Office transferred a check worth P2,936,128.00 to Mayor Celestino Marquez for the feeding program of 1,606 day care children of Pandi, Bulacan. The program, which is jointly implemented by the DSWD and the local government units (LGUs), is in support of the pro-poor program of the government. The feeding cycle has a duration of six (6) months or 120 feeding days. The Supplementary Feeding program is the provision of food in addition to the regular meals, to target children as part of the DSWD’s contribution to the Early Childhood Care and Development (ECCD) program of the government. The food supplementation will be in a form of meals to be served during meal time to children five (5) days a week. Despite successive heavy rains, the Kapit-Bisig Laban saKahirapan Comprehensive and Integrated Delivery of Social Services – National Community-Driven Development Program (KC-NCDDP) went full throttle last August 23-26, conducting two simultaneous activities to promote community empowerment. 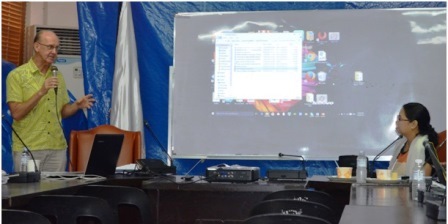 A Project Development Workshop (PDW)was conducted with the community volunteers in Talugtug, Nueva Ecija, while a Community-Driven Development Workshop with the Barangay Local Government Unit (BLGU) officials of General Mamerto Natividad took place in Azalea, Baguio City. In Baguio City, 43 participants were divided in a breakout session according to their respective positions. Here, the BLGU officials were taught strategies on how to efficiently manage the program. The participants also voiced out their sentiments regarding the project implementation. On the succeeding days of the workshop, all the participants were gathered as they listened to lectures from the resource speakers. As the four-day workshop ended, the facilitators made sure that all of the participants’ queries were properly addressed. Meanwhile in Talugtug, the community volunteers had a technical learning workshop session wherein they were taught to properly fill-out and process official documents for the sub-projects. After the activity, the participants felt empowered and more knowledgeable in technical processes. (City of San Fernando, Pampanga) Some P4,911,328.12 worth of relief goods has been provided to the victims of the Southwest Monsoon which occurred on August 12 affecting six (6) provinces of Central Luzon. As of 12:00 noon, August 12, disaster monitoring report, DSWD Field Office III reported that the assistance came from the DSWD and local government units (LGUs). Of the said amount, P2,143,329.62 worth of relief goods came from the DSWD; P1,642,845 from the local government units (LGUs) of affected towns; and 715,041 from the Provincial Governments of Bataan and Tarlac. As part of its augmentation support to the LGUs, the DSWD has likewise prepositioned family food packs to its provincial extension offices in the region. Likewise, the DSWD Central Office continues to send family food packs to augment the resources of the field office. The continuous rain has affected 177,251 families composed of 799,873 persons from 54 municipalities in six (6) provinces of Central Luzon. Pampanga, the hardest hit province has 78,932 families affected followed by Bulacan with 74,222 families and Bataan with 18,257. Of the total affected, 2,393 families composed of 9,534 persons are still staying in 95 evacuation centers (ECs) in the region. Of these, 1,676 families are from Pampanga; 305 families from Bulacan; 138 families 165 families from Tarlac; 205 families from Zambales; and 42 families from Bataan. In addition, 18,160 families are still being served outside the evacuation centers. The Southwest Monsoon has left 13 casualties: two (2) dead, nine (9) injured and two (2) missing. Director Gemma B. Gabuya attentively listens to the proposal of Mr. Hardy Ross, AustralianCivilian Corps adviser, with regards to the two-day workshop on the Field Office Manual on Disaster Response. Department of Social Welfare and Development Field Office III (DSWD FO III) held a consultative meeting with the Australian Civilian Corps (ACC) Adviser, Mr. Ross Hardy, today, August 18, 2016 at the Conference Room of the field office. DSWD FO III Regional Director Gemma B. Gabuya welcomed the specialist on Disaster Response Systems Development, and then laid emphasis on the importance of awareness and readiness of the department during crisis and disaster. The consultation meeting is an introduction for the two-day writing workshop on the Manual of Disaster Operations and Systems to be held on August 30-31, 2016. The DSWD Office III is the pilot region with regards to the facilitation of Development of Draft Field Office Manual on Disaster Response. Mr. Hardy and his team will be visiting other DSWD field offices, afterwards. “To better address the needs of those who are affected by the disaster, especially the most vulnerable group – for a well-coordinated response,” is the very objective of the upcoming workshop, said Mr. Hardy. The Department of Social Welfare and Development Field Office III has provided P776,454.00 worth of family food packs to the affected families of the Southwest Monsoon which occurred on August 12. A total of P610,470.00 worth of relief goods went to the Province of Bataan and P165,984 relief aid to Pampanga. Meanwhile, P1,127,128.50 worth of relief assistance from the combined resources of the provincial and municipal governments were provided to their respective affected areas. Further, P280,000 worth of assistance was provided by the non-government organizations to the victims in the Province of Bataan. DSWD has also prepositioned 17,491 family food packs to its provincial extension offices in Aurora (11,976 packs); Bataan (400 packs); Tarlac (980 packs); and Zambales (4,135 packs). As of 3:00 PM disaster monitoring report, the Southwest Monsoon has affected 26,747 families composed of 112,973 persons in 39 municipalities of the provinces of Bataan (10,088), Bulacan (4932), Pampanga (10,382), Tarlac (79), and Zambales (266). Of the 96 evacuation centers set-uop by the LGUs, 38 are still in operation serving 786 families or 3,336 persons. Meanwhile, a total of 2,422 families or 13,792 persons are being served in their respective communities. There were no reported damaged houses or o casualties as of this report.